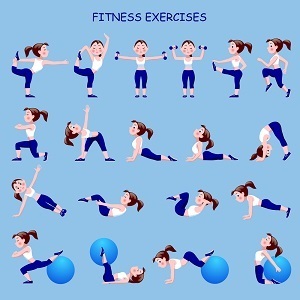 Exercise directory contains the many ways to exercise your body. Some of them are listed below. In addition, many others could easily be included in the exercise directory. This section lists aerobic exercise routines that you could do at sports and health clubs. Some of the machines used for these routines are listed below. 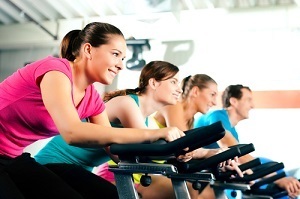 This section lists aerobic exercise routines that you could do in group classes. Some of these routines are listed below. This section lists aerobic exercise routines that you could do outdoors. Some of these routines are listed below. This section lists sports that involve aerobic activities. Some of these are listed below. This section lists workout videos that involve aerobic activities. The names of these workout videos are listed below. This section lists household chores that involve aerobic activities. Many of these chores are listed below. This section lists machines you can use in the home or the office to. This section lists play time activities that involve aerobic exercise. Some of these are listed below. Resistance exercises, also known as strength training, helps you build muscles. Also, these strength building routines help improve bone density. Some routines use only your body weight. Other routines use weights or similar gear, available in a gym. The following sections list strength building routines in the exercise directory. These routines use weights, and target muscle groups. This section lists strength routines targeting chest muscles. These routines are listed below. This section lists strength routines targeting back muscles. These routines are listed below. This section lists strength routines targeting the shoulders. These routines are listed below. This section lists strength routines targeting the biceps. These routines are listed below. This section lists strength routines targeting the triceps. These routines are listed below. This section lists strength routines targeting the quadriceps. These routines are listed below. This section lists strength routines targeting the hamstrings. These routines are listed below. Meanwhile, flexibility exercises stretch your muscles. Therefore they help your body stay limber. And, examples of flexibility routines include shoulder and upper arm stretch, calf stretch, and yoga. Most of all, balance exercises help prevent falls. And, examples of these balance routines include standing on one foot, heel-to-toe walk, and tai chi. Especially relevant, time constraint or individual preference may guide you to one category of exercise . However, you get the most benefits by including two or more categories of exercise routines. Furthermore, including all four exercise categories provides the most benefits.